“Researchers at the Institute for Quantum Computing (IQC) performed the first demonstration of quantum-enhanced noise radar, opening the door to promising advancements in radar technology. 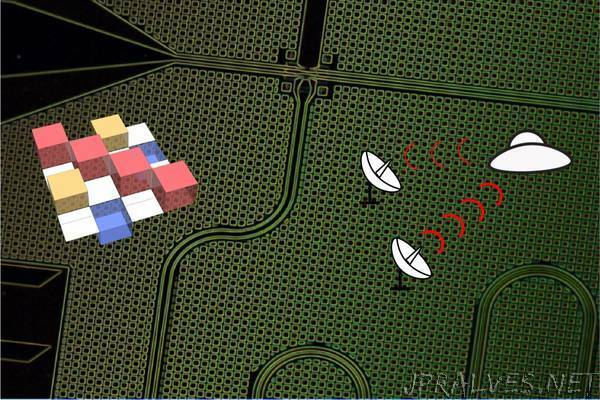 The researchers showed how the quantum process can outperform a classical version of the radar by a factor of 10, enabling the detection of objects that are faster, smaller, or further away – all while making the radar less detectable to targets. In the lab, Wilson’s team performed an experiment to directly compare the performance of a quantum protocol to a classical protocol. The researchers generated entangled photons using a device they designed to produce multiphoton entanglement of microwave light at frequencies near 5 GHz—the same frequency band as wireless communications used by cellphones and Wi-Fi connections. Next, they created a classical source of photons that, on the surface, replicated the signals produced by the quantum device, but without the entanglement. When the photons from each source were sent through the detection scheme, in a head-to-head comparison between the quantum and classical protocols, the researchers found that the quantum source outperformed the classical source by a factor of 10. The experiment marked a milestone as the first demonstration of quantum illumination in the microwave regime. “This is exciting because it is the same frequency that most radar systems operate at, meaning there could be more immediate, practical applications for current radar technology,” Wilson said.